Shabazz Muhammad (#1 Scout, #1 Rivals, #1 ESPN) made quite a statement at the HoopHall Classic, unequivocally showing once again why he's considered the #1 prospect in the 2012 high school class. Muhammad scored 37 points in a win over Dematha Catholic, regarded as one of the best teams in America, shooting 12 of 22 from the field and 12 of 14 from the free throw line. Muhammad may not be the biggest or most athletic swingman we've seen at the high school level, but his combination of length, scoring instincts, aggressiveness and smarts gives him considerable upside and should allow him to make an instant impact in college next year. A fairly complete offensive player, Muhammad can put up points in bunches from anywhere on the floor, both in transition or in the half-court. He attacks the rim relentlessly with his solid first step and finishes with authority whenever possible, showing good upper body strength taking hits in the paint and drawing fouls. If the paint is closed off, Muhammad can pull up off the dribble smoothly with range out to the 3-point line, having the ability to just throw the ball in the basket thanks to his excellent touch. Also a very effective post-up threat, Muhammad isn't afraid to go into the paint to find touches if the defense is overplaying him on the perimeter. He's a prolific offensive rebounder at the high school level thanks to his long wingspan, strong leaping ability, and the excellent intensity he brings on each possession, allowing him to find plenty of easy points simply by outworking the competition. Muhammad still has room to grow as a ball-handler in the half-court, particularly with his ability to drive and finish with his right hand. This isn't much of an issue at the very up-tempo high school level, but is something teams could focus on in the future in advanced scouting reports. He isn't known as a great catch and shoot threat with his feet set either, something that we weren't able to see much of in this setting. Muhammad displayed a very high basketball IQ in Springfield, rarely forcing the issue and willingly passing out of double teams when defenders inevitably collapsed on him. Unlike many players his age, he has no problem playing off the ball and doesn't get discouraged when things don't run through him on every possession, which is a very good trait. Another thing scouts will like to see is the competitiveness Muhammad shows on the defensive end. He uses his length and strength effectively to stay in front of his matchup and contest shots, looking willing and able to make his presence felt here and on the glass. While Muhammad may not possess the can't miss superstar upside of former #1 overall recruits such as Dwight Howard or LeBron James, his scoring instincts and physical and mental toughness make him a pretty safe bet to develop into a very good NBA player, along the lines of James Harden, for example. It's tough to rule out significant improvement considering his age and the productivity he's displayed thus far, so its likely too early to put a ceiling on him. We'll have to see what he looks like once he reaches the college ranks to get a better read for his true potential. 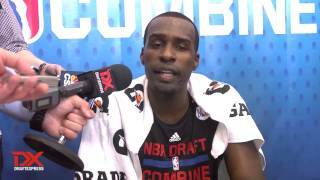 Shabazz Muhammad is one of the most intriguing long-term prospects seen at this event. It's pretty clear from watching him here that he has an excellent future ahead of him. A pure scorer would be the best way to describe Muhammad's game. He's as aggressive and confident an offensive player as you'll find in the high school ranks. Muhammad shows a quick first step and a knack for creating his own shot and getting to the basket. He doesn't need much daylight to get his shot off and can put the ball in the rim in a variety of different ways. Left-handed, he's particularly fond of using the glass in transition. As explosive as he is around the basket, it's Muhammad's craftiness scoring in the paint that makes him stand out so much. Floaters with either hand, smooth lefty pull-ups, crafty scoop shots, post moves, turnaround jumpers or just putting himself in the right place at the right time for an offensive rebound, Muhammad finds a way to fill up the score sheet and looks determined to do so every time he steps out on the floor. He's very business-like in the way he goes about things. He's always around the ball, and he's never afraid to step up and take responsibility when the situation calls for it. Muhammad's aggressiveness in putting up points could rub people the wrong way at times, as he doesn't appear particularly apologetic about the way he produces on the offensive end. He tends to dribble aimlessly and force the issue at times and displays questionable shot selection. He still needs to improve his decision making and his passing ability and cut down on turnovers.